Meant to exhibit something of an untamed interior life, Chuck van Zyl hopes his concerts are part of an ongoing chain of innovation. His carefully realized designs are based on a consistent, timbral grammar developed through decades of work. As artists bring greater clarity to their vision over a lifetime, with further live experiences Chuck van Zyl has become more proficient at his craft, and more of who he is musically. Injecting emotion and expression into what would otherwise appear to be a formal exercise, his concerts are a manifestation of his urge to tell. The double CD Recitals presents music recorded at five May 2016 performances, and like contemporaneous works by Redshift, Node and Arc, draws on higher-order capacities. His shows for Event Horizon, MUSIC WITH SPACE, STAR'S END, DIGITAL DREAMS and Digital Underground were documented with an ordinary two-track recording device. After months of review, two 70+ minute sonic journeys were produced, and released as Recitals. Each event offered an essential setting, audience and atmosphere - as well as its own unique challenge. 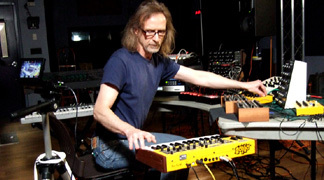 To better connect with his audience, van Zyl set up his equipment among them, explaining that they were welcome to observe him up close as he traversed the next hour's worth of unrestricted sonic space (video documents of each concert have been posted for truer scrutiny of these performances). Through an impressive collection of vintage and modern synthesizers and keyboards, electricity was transformed into sound, and we were lifted into infinite spaces. Beckoning toward the eternal, reverberant Mellotron flutes and strings light out in expressive fanciful flights. In a brace of free improvisation van Zyl flaunts angelic harmonies, just as easily as he mines subterranean frequencies - all in keening consonant concord. Each movement finds portent sounds building dense harmonic forms, out of which emerges motoric sequencer patterns. These echoing interlocking runs of notes expand, contract and breakdown in ever heightening circles. The mounting compositional tension, released in our minds as impressionistic cerebration, feels energizing. Minor key chords slowly sweep across the sound field. 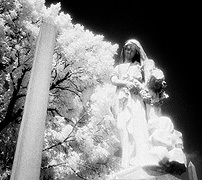 Synthetic drones hold, darken, then lighten, informing the music's mood. In an ascending rush, then a descending calm, we depart our more common thoughts... for mysterious regions. Eventually we find the end of this journey, as the music resolves, and settles the listener into the drifting dream of gently humming circuits and charged solid states. Recitals is a wonderful example of van Zyl's talent for spontaneous composition within the context of an improvised live performance. It is a reflection, realized through action, intervened upon by spontaneity, which leads the listener into contemplation - and a wonderful reverie realm. Chuck van Zyl relentlessly seeks to identify the greater virtues of Electronic Music - yet enjoys the fact that his endeavors still hold some secrets. Recitals features works of passionate intensity, and is for anyone seeking a deeper examination of sound and mood. It pulls us through a spiraling cerebral cosmos - where a musician finds his moment.